In a recent blog post, Microsoft announced Azure Cost Management has reached general availability (GA). Azure Cost Management provides a native cost management solution for enterprise customers which allows organizations to manage and optimize Azure costs across their subscriptions using in-product tools. In addition to Azure Cost Management being made available for enterprise customers, it is now in public preview for Pay-As-You-Go customers and Azure Government cloud. Azure Cost Management offers similar functionality to Azure Cloudyn, but is a native Azure cost management solution, whereas Cloudyn provides cost allocation, showbacks/chargebacks for other major public cloud providers including AWS and Google Cloud Platform. Cost optimization is the benefit of using the cloud. App teams make decisions on costs and utilization everyday that affect cost. So the developers, architects and operators are making decisions in code that are changing the utilization of the cloud. But, how are those costs being tracked for the organization? What we have really learned is we need tools and processes that allows you to manage your cost and get the most out of the cloud. 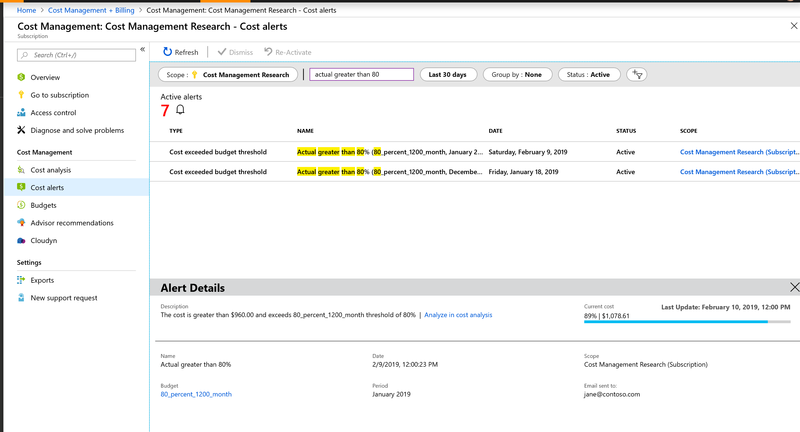 Inside of Azure Cost management, several features exist including cost analysis, budgets, data export, APIs and alerting. 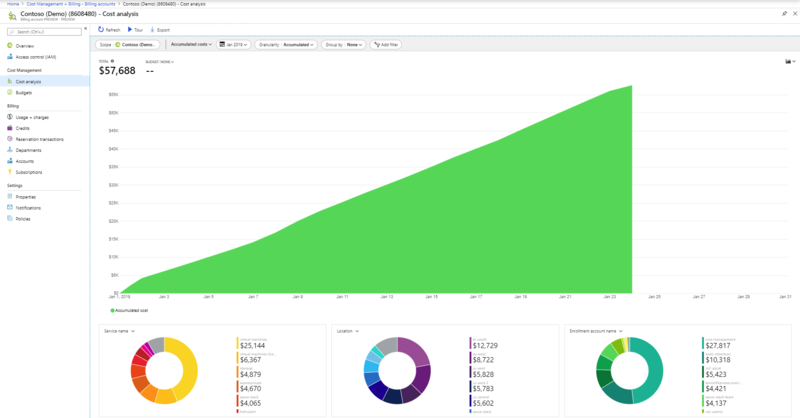 Cost analysis allows organizations to track costs over the course of the month and analyze the results by understanding where costs are coming from, how much different services cost and create customized views that allow organizations to discover insights quickly. These insights may include how much an organization has spent and provide a trendline that helps customers assess if they will stay within budget. Budgets proactively allow organizations to manage costs and drive accountability by allowing individuals within an organization to forecast their spend over a period of time. When these budget thresholds are exceeded, notifications can be triggered, but the consuming services are not stopped. Monthly budgets are evaluated against spend, every four hours, but data and notifications are available within eight hours. Alerts can be managed in a single location by using the new alerts feature, which is currently in preview. Within this feature, an organization can set and view budget, monetary commitment and department spending quota alerts. All cost data is available for export to an Azure storage account using the export feature. This activity can be scheduled on a daily, weekly or monthly basis and the data is available in CSV format. This data can then be loaded into financial management tools or Power Bi for additional data exploration. 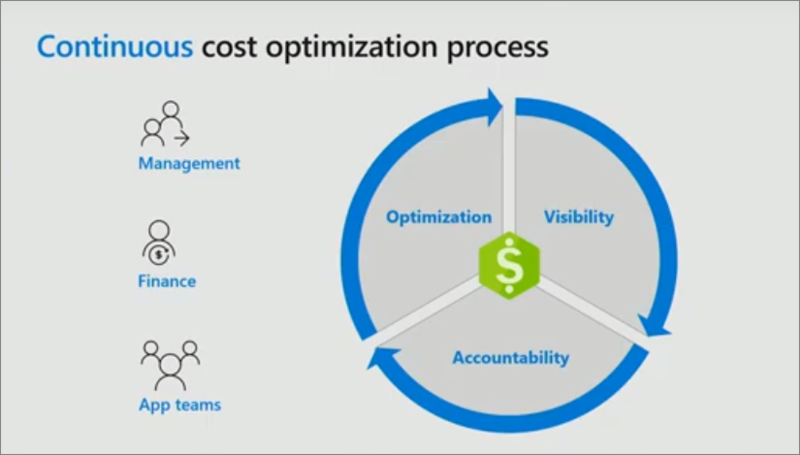 Azure Cost Management has also included new REST APIs that allow organizations to better manage their costs including Usage Query, Budgets, Exports, and Usage details by Management Group. We will continue to iterate additional Cost Management features, so users can enjoy a more unified user experience with features like the ability to save and schedule reports, additional capabilities in cost analysis, budgets, alerts, and exports, as well as showbacks in the coming months. In addition, Microsoft has plans to leverage Azure Cost Management capabilities in the Cloud Solution Provider (CSP) program, an initiative that helps partners resell licenses and provide managed services.